Save 30% on Canal du Midi cruises for 3 nights or more throughout 2019. 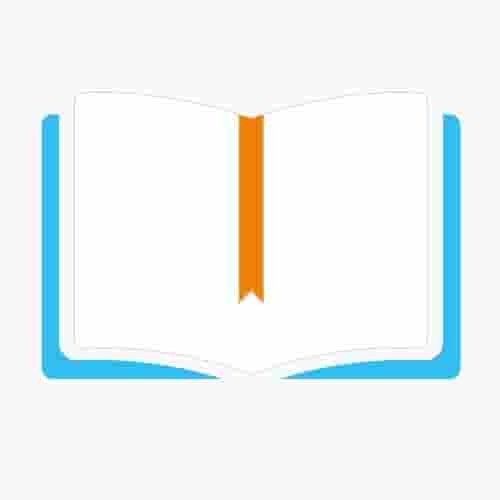 Book by 24 April 2019. Nestled in the Languedoc wine region, the Canal du Midi is an ideal locale for wine tasting holidays. Tour vineyards, visit wine caves and taste free samples. Trèbes, Homps, Ventenac, Paraza, Marseillette and Capestang offer much for wine connoisseurs! The Canal du Midi is steeped in history and heritage. You’ll see stunning cathedrals, grand châteaux, ancient ruins and medieval cities. Carcassonne is a real gem. Museum fans will love Castelnaudary, Béziers, Narbonne and Toulouse! Friendly cafés and gourmet restaurants abound on the Canal du Midi! Try La Raffinerie in Béziers, Carcassonne’s La Marquiere and L’Arbousier in Homps. Don’t miss the slow-cooked bean and meat cassoulet (casserole), a French gastronomy specialty of Castelnaudary. There’s something for the entire family on the Canal du Midi — amusements and rides at Luna Park in Le Cap d’ Adge and the Raymond Chésa Leisure Park near Carcassonne. The kids’ll love watersports at Lac de Jouarres in Homps and Toulouse’s Cité de L’Espace! Truly an outstanding feat of engineering when completed in 1694, the main course of the Canal du Midi runs 240 kilometres (150 miles). 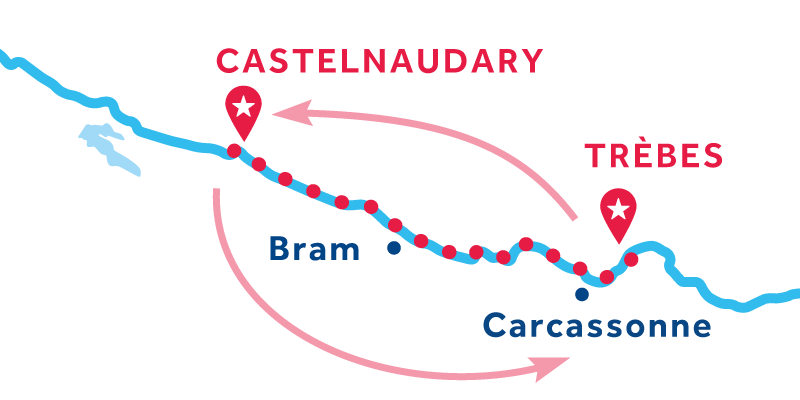 Its very name is imbued with resonance—the canal of two seas—since its network of waterways connects the Atlantic to the Mediterranean and once served as a major trade route. Its designer, Pierre-Paul Riquet, created a work of art with aqueducts, bridges, 91 locks and a tunnel. More than 42,000 plane trees line its often-shaded banks! Canal du Midi boating holidays present an opportunity to experience this fabulous waterway firsthand with your family and friends, inviting you to travel at a pace that lets you get to meet the people and relax amidst stunning natural beauty. Canal du Midi holidays are amongst our most popular offerings, and with so many bases to choose from there’s a perfect cruise for you! As with many great canals, the idea to build the Canal du Midi had been around a long time. In 1516, King Francis I hired Leonardo da Vinci to survey a route. When Pierre-Paul Riquet got going in 1667, one problem was how to lift boats over the 190-metre (620-foot) heights at Naurouze. Reservoirs and dams were built. You’ll see neoclassical elements in many structures on your Canal du Midi holiday! In 1996, the canal became a UNESCO World Heritage site. The Canal du Midi is easy to navigate and ideal for beginners. 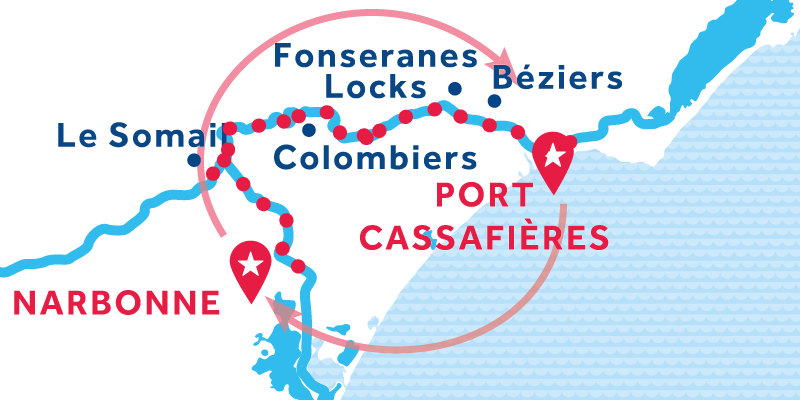 Tips : If you are cruising down to Béziers, consider mooring at the top or bottom of the locks of Fonsérannes if you want to walk or cycle into Béziers for sightseeing. Locks are fully automatic, manned and free of charge. During the busy summer season locks are open 09:00-19:00 (7:00 p.m.). Locks are closed for lunch between 12:30-13:30 (1:30 p.m.). Public holidays: Locks are closed on some public holidays : 1st May & 1st Nov.
Moorings are plentiful on the Canal du Midi, most of them are offering electricity and water refill for a small charge. You could also moor where you want to along the canal thanks to the ropes and spikes on-board your boat. Please do not cross the pathway with the ropes in order to allow the passage of walkers and cyclists. 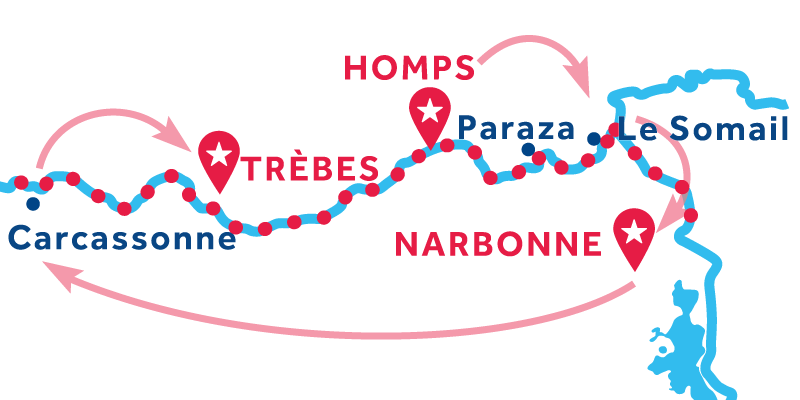 Despite the flooding in October our bases in Narbonne, Homps and Trèbes will be open as planned for the 2019 season. Toulouse is the fourth largest city in France and is renowned as a center of aviation and spaceflight, the home of French rugby and for being a University town. Yet the ‘Pink City’, so named because of the dusky-pink bricks used in many of its buildings, remains intimate and welcoming with a laid-back vibe. Visitors can enjoy submersing themselves in true French café culture, with a host of museums and cultural attractions to keep them occupied. Part of the sprawling suburbs of Toulouse and a short walk or cycle from the Canal, Castanet-Tolosan has a busy shopping centre where you will find everything you should need, including local produce and crafts. This quiet 13th century town has a Gothic church with a typical Toulouse-style bell tower – worth a 500m stroll into town for a photograph if the weather is nice. You’ll find moorings at Montigiscard Lock, with a pharmacy and a good restaurant just over the road, the Brasserie de l’Ecluse. Gardouch is an typical village of the area. Moor here to enjoy a peaceful walk downtown. Visit the village's beautiful church and eat in one of the excellent restaurants. This is a bustling little village which boats a fine example of a wall bell-tower, flanked on each side by two octagonal towers. There are a variety of shops, cafés and restaurants here if you fancy a 2km walk or cycle from Renneville Lock where you can moor. We can recommend La Camaretoise for excellent sweet and savoury crêpes. This purpose-built tourist marina has good moorings for the night with a restaurant (La Dinée, open daily for breakfast, lunch and dinner and has free Wi-Fi), a gourmet shop selling regional produce and a fascinating Canal du Midi exhibition behind the restaurant in Haute-Garonne House. It tells you everything you need to know about this majestic waterway: its history, its construction and its continued operation. 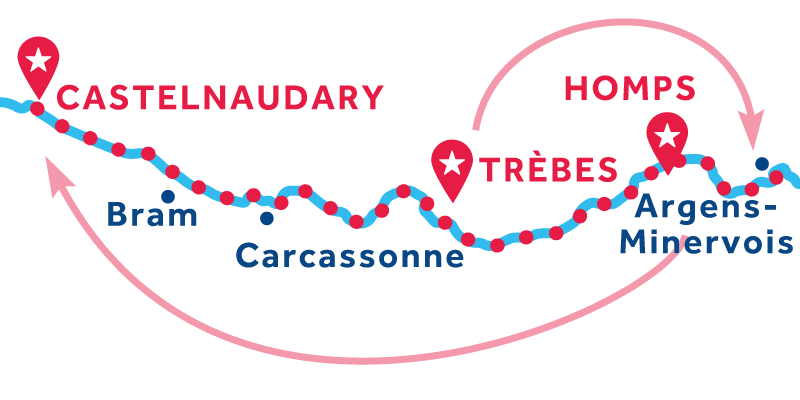 As well as being one of the home ports for the Le Boat Midi fleet, the historic market town of Castelnaudary is home of the Cassoulet, a regional dish of white beans and chunky pieces of pork and duck. There are several places in town claiming to serve the best. To stock up on provisions there is a Spar supermarket 1.1km away in the town centre, where there are also ATMs, etc. If you spend over €100 they will usually be able to deliver your goods to your boat. Alternatively, there’s a Netto supermarket 600m from the base, although it’s along a busy road. If you find yourself short on provisions, this quiet little village has a bakery and a small grocery store, although don’t expect a wealth of choice. However, the 2km walk or cycle through the countryside to get there is a delight. You will find all you need in town to replenish your provisions, including a chemist and a service station which doubles as a supermarket. Upstream of Villepinte Lock, look out for the Mézéran Aqueduct and the Villepinte Spillway which diverts excess water into the Fresquel River below. A pretty, but quiet village built on a circular plan with a 13th century church at the heart. A pleasant walk or cycle along a pretty tree-lined avenue will take you directly to the village where you’ll find several restaurants (including a pizzeria opposite the museum), a grocery store, butcher, patisseries and several other shops. Back at your boat, why not chill with a drink after your walk/cycle at L’lle aux Oiseaux right on the canal? Moor by the charming stone bridge, over which the road gives access to the village a short 500m away. Seek out the pretty church and clock the Sully Elm, planted in the square outside; it is one of the last elms still alive in France; all the others were killed by Dutch elm disease. You will find a grocery shop here too. After the Eiffel Tower, this citadel, known as ‘La Cité de Carcassonne’, is the second most visited tourist attraction in France. And, as you catch glimpse of its fairy-tale turrets and imposing walls when you approach the city, you’ll soon understand why. A UNESCO World Heritage site, this fortified, medieval, walled city is unique in Europe by its size and its state of conservation. It is renowned for its double wall of ramparts, running nearly 3km around the perimeter and 53 conical-roofed, fairy-tale towers. 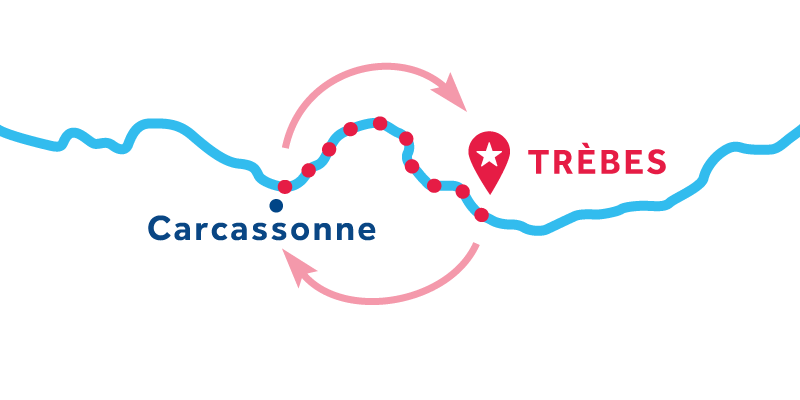 Le Boat has a base in the thriving town of Trèbes and, whether you are starting your journey here or passing through, visitors are pleased to visit the very large supermarket, 1km from the moorings, for a chance to stock up on provisions (the base team can give you directions). Just to the southwest of Trèbes you’ll find the Cavayère Lake, a popular summer spot full of family activities including swimming, a wildlife park and adventure trails. Ask our base team for help arranging transport. A working farm and wine domain with 12th century origins, Millepetit is home to a wonderful little cooking school. This unique French cooking class will provide you with useful skills and simple tips that will help you to create classic French cuisine with a modern twist (must be booked in advance). There’s a handful of cafés and restaurants here but nothing else really worth stopping for. The clock tower in the centre, before it told the time, served as a relay for the first telecommunications network in the world. Marseillette is also known for growing rice (short grain, long, fragrant and red) which you will find in local shops, delicatessens and supermarkets along the canal. This is a village full of medieval character with a lovely church... although not a great deal else! You won’t even find much in the way of shops or restaurants here. Nonetheless, you’ll enjoy a gentle saunter up and down its quiet streets. A pretty and leafy town built around a grand Château, now a luxury hotel with an excellent restaurant. The town has a supermarket, pharmacy, bakery, butcher and a handful of restaurants. There are usually plenty of moorings either side of the bridge. And note the Argent-Double Spillway just north of the bridge where excess water passes under the arches and falls in the Argent-Double River below. The small village of Homps, where Le Boat has a base, was for a long time an active trading port where barrels of Minervois and Corbières wine were loaded for their journey to Bordeaux. The waterside buildings testify to these bygone days. There is a grocery store, a small selection of restaurants, a wine shop and a café-bar in the village. 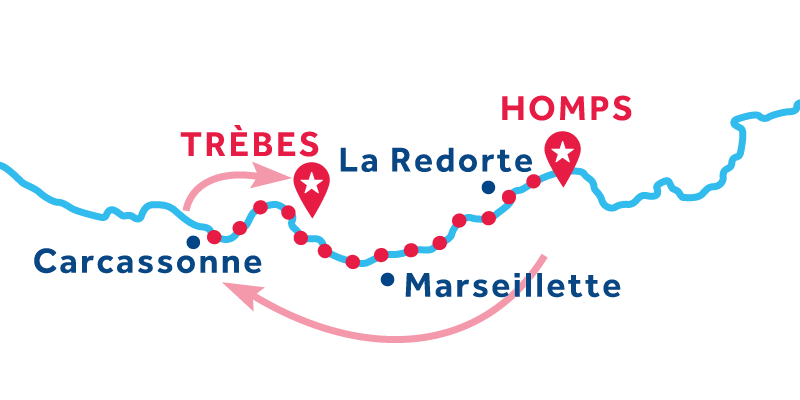 If you’re up for a 12km bike ride (add bike hire to your booking, or hire them for the day from our Homps base), you can cycle from Homps to Minerve. This is one of France’s most beautiful towns, with charming cobbled streets, a maze of narrow alleys, quaint dwellings and a simple 12th century church. The town is perched high on a rocky promontory with rivers running through deep gorges on either side. It can be reached only by a high bridge and was the site of a famous siege in the medieval age. Before you reach Argens-Minervois, (or after you leave it if you are heading west), you can get some great views over the village by scaling a short but steep path at Pechlaurier Lock which leads to a look-out. The village itself is overlooked by the square towers of a 14th century château and is a lovely little place to stop, with its narrow cobbled streets to wander around. There are ample public moorings, and there is a grocery store, a café-bar and a restaurant. The village of Roubia is very pretty with an old stone church and tower, and there’s a grocery store and restaurant in the village. The village of Paraza has a café-restaurant, a grocery store and a lovely church, Notre-Dame de l’Assomption, which was once located in the path of the canal. Riquet had it dismantled and rebuilt where it stands today. Inside, the nave, the choir and the vaults are adorned with beautiful stencilled decoration dating from the 19th century. There are plenty of public moorings before and after the bridge. To the west of Paraza is the Répudre Aqueduct, tthe first canal-bridge ever to be built in France and the second in the world! Le Somail was once an important harbour for trade and served as a ‘lying’ stop for passengers coming from Sète or from Toulouse. Nowadays, it is a beautiful little Languedoc village, home to some nice restaurants, a couple of artist studios and a grocery store. A 700m stroll along a tree-lined avenue and into town will take you to a handful of restaurants, a grocery store, a butcher, two bakeries and a café-bar. Capestang is a small market town with a good range of shops, including a supermarket, three bakeries, several café-bars and restaurants and an impressive 14th century church. The stone bridge over the canal has the reputation of being the lowest on the canal (the lowest is actually in Carcassonne). Its curved shape makes it quite tricky to pass under – so take it slow and steady. The small, pretty town of Colombiers is a lively place and there is a pleasure port here with fresh water (you’ll need to buy tokens) and an electricity point. There is a supermarket, pharmacy and newsagents right at the port. After a 300m stroll into the village, you’ll find a lovely patisserie, more restaurants and a pretty church. Just to the west of the town you'll come across the Malpas Tunnel, the first canal tunnel in Europe. Just outside the city of Béziers you will encounter one of Riquet’s most ingenious engineering solutions, the Fonserannes Locks. It’s a staircase of locks, originally composed of eight chambers in a row, which allowed boats to be raised a height of 21.5m across a distance of 300m. Today, only seven chambers are still in service. Béziers is the capital of Languedoc’s wine industry and birthplace of Pierre-Paul Riquet, who was responsible for building the Canal du Midi. Like all cities with a long history, Béziers is best discovered by ambling through its medieval streets, its bright squares and its leafy parks. The large and lively village of Villeneuve-lès-Béziers has very good amenities including several restaurants, bars, and a Spar supermarket. This is an excellent spot to stock up on supplies. This is a busy little town, but there’s not much to stop for besides the very large Intermarché supermarket, just 200m from the canal. However, you will need to cross a busy main road at an intersection to get there, so please take care. Moor as close as you can to the concrete bridge with green railings. There’s a smaller Spar supermarket in Villeneuve-lès-Béziers if you prefer. This is a cheery town with a butcher and a couple of nice restaurants. It’s worth stopping at if you find yourself there when a market is on. Otherwise, don’t make any great effort to plan it into your itinerary. Port Cassafières is a small marina where Le Boat has a base with fresh water and electricity points. Once a Greek city, a medieval fortress and a rich village during the Renaissance, Agde was largely built using black volcanic rocks. The old town has a lovely little centre with cobbled streets full of pleasant shops, restaurants and buildings with medieval architectural details. It also has a pretty church and a local museum. This is a busy seaside resort with a plethora of fun activities for kids, including the beach, an aquarium, a fairground and a huge waterpark. 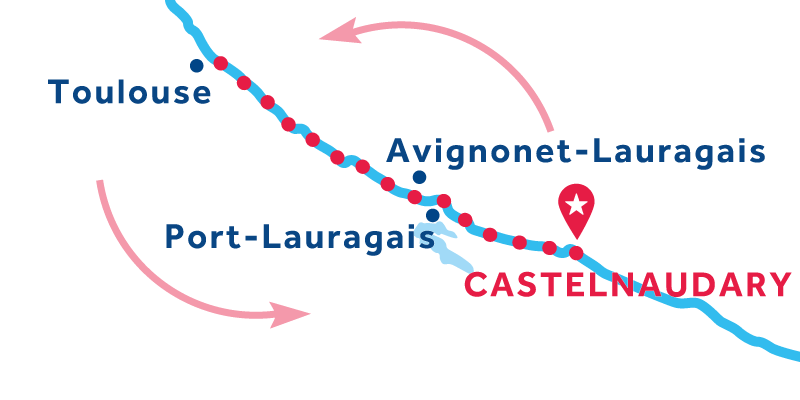 It’s about 7km from Agde Round Lock, and 5km from Bagnas Lock (should you choose to cruise further west), so you’ll need to cycle or arrange a taxi either way. This is a charming little village, worth a stroll around to find the quirky Chapel of St. Roch and Le Calvarie, a pretty, roofed structure of stone walls and arches which is now (or soon to be) a park for the people of the village to share. In the centre, there are a couple of grocery stores, a bakery and several restaurants. Narbonne has a rich heritage where grand and ancient buildings sit majestically among a network of clean, modern and lively streets and boulevards. It has a wonderful southern French atmosphere with a Spanish twist. Highlights include the Saint-Just-et-Saint-Pasteur Cathedral (the third tallest in France) and the Archbishop's Palace dating back to the Roman era. And of course, it is also home to one of Le Boat’s bases. The town of Gruissan is a lively seaside town, full of French character and a rich history. Located 5km away from the canal on the Mediterranean coast, it is definitely worth the effort to get to. Gruissan was originally a fishing village on a small island surrounded by marshland. The narrow streets of old Gruissan village are built around the 13th century castle and form a circular pattern. In recent years, Gruissan has expanded considerably with the development of a modern yachting marina with a bar and restaurants and a casino built along the palm-lined quays. Known as the island of a thousand scents, this is a nature reserve of exceptional beauty, comprising 825 hectares of peaceful surroundings, breath-taking vistas and abundant wildlife. Walk or cycle in the shade of pine trees on a 3km or a 7km circuit, and look out for wild pigs and deer, as well as amazing bird life. Port-la-Nouvelle, the last town on the Embranchment de la Nouvelle, is a bustling fishing port. On the seafront you'll find many restaurants and bars, and the beach is wide and sandy - perfect for sunbathing or a day of family fun. Don't forget to try the seafood, it is as fresh as it gets! To help you get an idea of how far you can travel in the time you have, here's a selection of routes to and from our bases in this region. You don't have to stop at all the places listed or follow the route exactly. So long as you return your boat to your end base by the date you've booked - you're free to enjoy your cruise however you like. For a comfortable pace, allowing you time to regularly stop and explore, we'd recommend an average of 2 - 4 hours cruising each day. An extensive 14 night return cruise that will let you balance busier and quieter section of the canal. Relax and unwind or fill your day with adventure, this cruise lets you choose on a day-by-day basis. 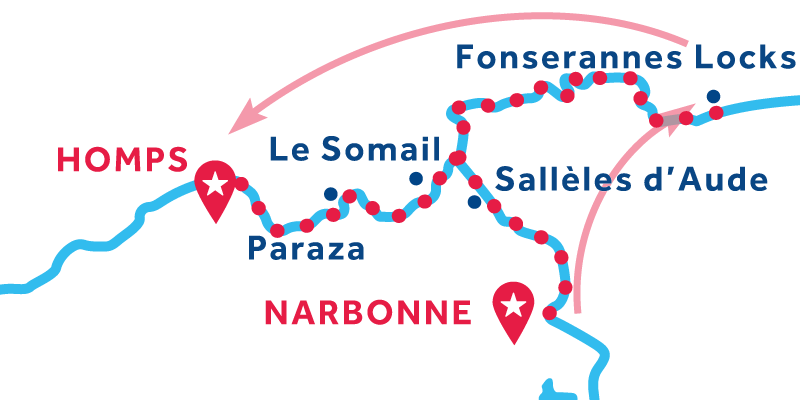 Depart Narbonne: Enjoy a wonderful southern French atmosphere with a Spanish twist. Visit the Saint-Just-et-Saint-Pasteur Cathedral (the third tallest in France) and the Archbishop's Palace. Le Somail: Enjoy al-fresco dining in one of the fabulous canal-side restaurant in this popular and very pretty village. Check out the books and the antique bookshop. Paraza: Small village famed for its Chateau which produces excellent wine. Stop for a wine tour and tasting. Argens-Minervois: Home to a 14th century château and cobbled streets, this is a lovely place to stop and enjoy the ample cafés and restaurants. La Redorte: A pretty and leafy town built around a grand Chateau, now a luxury hotel with an excellent restaurant. Marseillette: Famed for growing rice, a clock tower in the centre of Marseillette served as a relay for the first telecommunications network. Trèbes: Stock up on excellent local produce including wine, olives, jams and confits. Then visit the family friendly Cavayère Lake. Villesèquelande: Seek out the pretty church and clock the Sully Elm, planted I the square outside; it is one of the oldest elms still alive in France! Villepinte: You will find all you need in town to replenish your provisions. 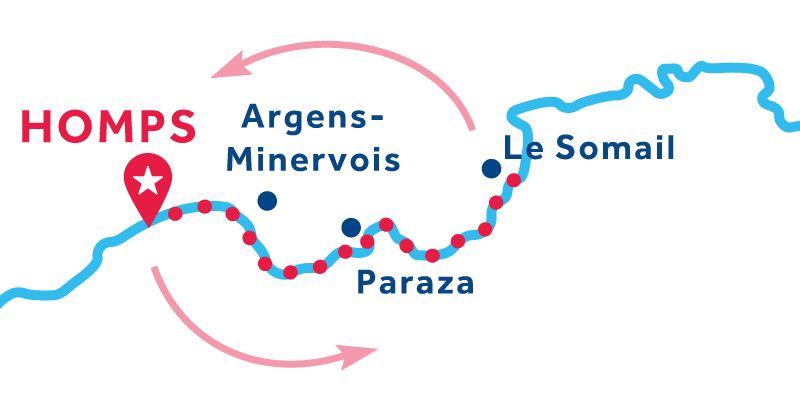 Upstream of Villepinte Lock, look out for the Mézéran Aqueduct. Castelnaudary: The capital of the Cassoulet (a local specialty) try some before you leave. A stroll to the Cugarel windmill for stunning views across the Black Mountains is also worthwhile. Pexiora: A delightful 2km walk or cycle from the canal, this quiet village has a bakery and small grocery store. Bram: A pretty and quiet village built on a circular plan with a 13th century church at the heart. Check out the Archaeology Museum to discover more than 4,000 artefacts found onsite or nearby. Carcassonne: Breath-taking, UNESCO-listed, fortified citadel with 3km of ramparts, a castle, cathedral and shops and restaurants within the city walls. Millepetit: Stop for a wonderful cooking school – learn how to create classic French cuisine with a modern twist! Puichéric: A village full of medieval character with a lovely church and worth a stop if you love watersports – you can hire canaoes, kayaks or standup paddles boards and ‘mess about’ on the adjacent River Aude. Homps: The small village of Homps, where Le Boat has a base, was for a long time an active trading port where barrels of Minervois and Corbières wine were loaded for their journey to Bordeaux. Roubia: Roubia is very pretty with an old stone church and tower, there’s also a grocery store and restaurant in the village. Ventenac-en-Minervois: This village is noted for its waterside wine cellar in the canal-side Château de Ventenac-en-Minervois. Visit, and sample local wines for free. Sallèles d'Aude: Stroll around to find the quirky Chapel of St. Roch and Le Calvarie, then enjoy the village’s several restaurants. A long 10 night return cruise that will take you along sections of the canal with plenty to see-and-do. Perfect for those looking to mix historic sites, top-notch gastronomy and world-class wine. Capestang: A small market town to stock up on provisions. Enjoy passing under the stone bridge, which is one of the lowest on the canal! 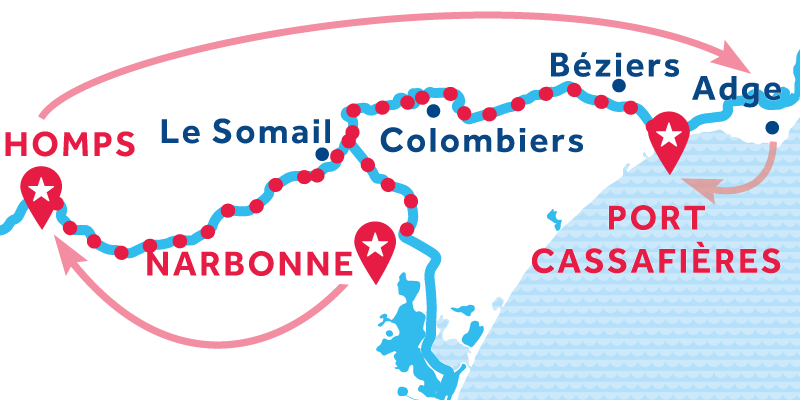 Colombiers: A lively place, just to the west of the town you'll come across the Malpas Tunnel, the first canal tunnel in Europe. Béziers: The birthplace of Pierre-Paul Riquet, the engineer behind the Canal du Midi. Wander Béziers’s medieval streets, bright squares and leafy parks. The Fonserannes Locks: Delight in ascending or descending the seven chambered Fonserannes Locks – one of the marvels of the Midi. Argeliers: A 700m stroll along a tree-lined avenue and into town will take you to a handful of restaurants, a grocery store, a butcher, two bakeries and a café-bar. A week-long cruise that includes the finest ancient sites along the Midi, from Roman Narbonne to medieval Carcassonne. A week-long return cruise that takes you past the Midi’s most impressive engineering feats at the Malpas Tunnel and the Fonserannes Locks. All on the way to ancient town of Béziers – birthplace of Pierre-Paul Riquet, the engineer behind the Canal du Midi. Depart Trèbes: Stock up on excellent local produce including wine, olives, jams and confits. Then visit the family friendly Cavayère Lake. Poilhes: Poilhes is a charming canal-side village with a small shop and a handful of lovely restaurants. Depart Castelnaudary: The capital of the Cassoulet (a local specialty) try some before you leave. A stroll to the Cugarel windmill for stunning views across the Black Mountains is also worthwhile. La Redorte: A pretty and leafy town built around a grand Chateau, now a luxury hotel with an excellent restaurant..
Villeneuve-lès-Béziers: The large and lively village of Villeneuve-lès-Béziers has great restaurants and bars. It is also an excellent spot to stock up on supplies. Cers: A busy little town, but there’s not much to stop for besides the very large Intermarché. Portiragnes: A cheery town, stop here for the Monday morning and Tuesday morning markets. Arrive Port Cassafières: Port Cassafières is a small marina where Le Boat has a base with fresh water and electricity points. 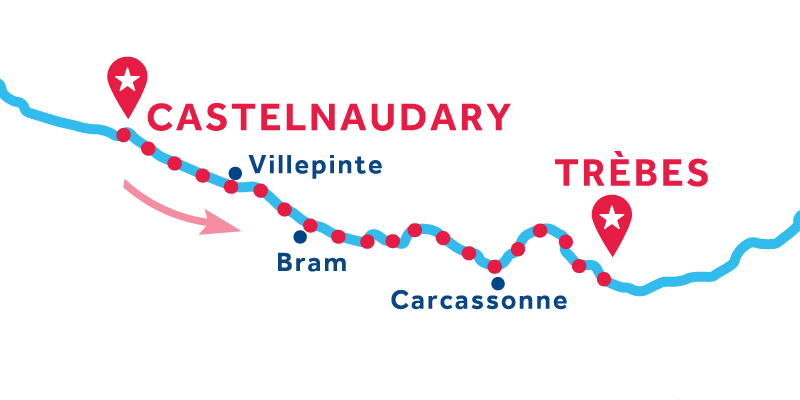 A week-long one-way cruise that takes in some of the Midi’s top sites, as well as some of the peaceful villages that line the banks. Arrive Castelnaudary: The capital of the Cassoulet (a local specialty) try some before you leave. A stroll to the Cugarel windmill for stunning views across the Black Mountains is also worthwhile. A week-long return cruise that mixes historic sites and family activities. Agde: Visit Agde’s old town with its cobbled streets full of pleasant shops, restaurants and buildings with medieval architectural details. It also has a pretty church and a local museum. Le Cap d’Agde: You’ll need to cycle or arrange a taxi to visit, but once there you’ll discover a plethora of fun activities for kids, including the beach, an aquarium, a fairground and a huge waterpark. Port Cassafières: Port Cassafières is a small marina where Le Boat has a base with fresh water and electricity points. A week-long one-way cruise that lets you explore both the Canal du Midi and the Embranchment de la Nouvelle. 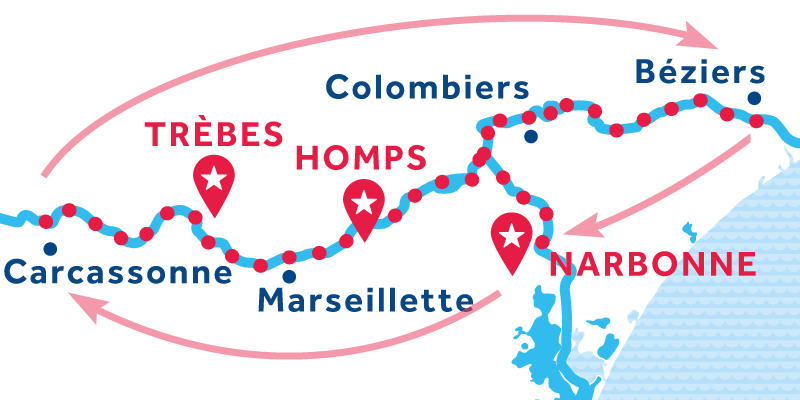 Depart Homps: The small village of Homps, where Le Boat has a base, was for a long time an active trading port where barrels of Minervois and Corbières wine were loaded for their journey to Bordeaux. 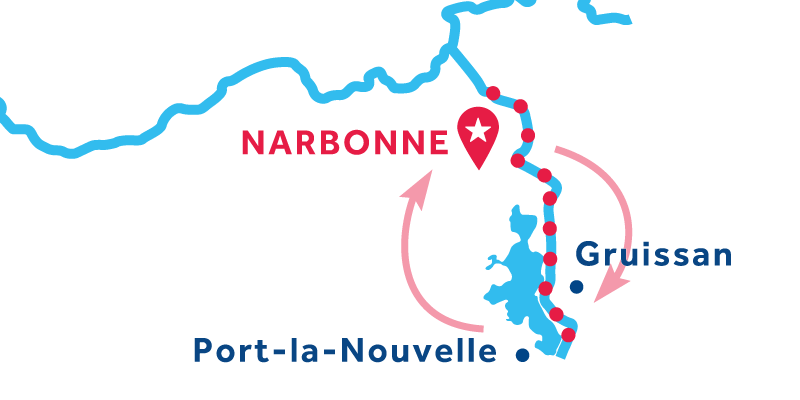 Narbonne: Enjoy a wonderful southern French atmosphere with a Spanish twist. Visit the Saint-Just-et-Saint-Pasteur Cathedral (the third tallest in France) and the Archbishop's Palace. Arrive Trèbes: Stock up on excellent local produce including wine, olives, jams and confits. Then visit the family friendly Cavayère Lake. A week-long return cruise past quiet villages and historic sites, all within short distance of Mediterranean beaches. Depart Port Cassafières: Port Cassafières is a small marina where Le Boat has a base with fresh water and electricity points. A week-long return cruise that takes you through tranquil villages on a quieter section of the canal, before you arrive at Toulouse with its cosmopolitan buzz and ample cultural attractions. Avignonet-Lauragais: A sweet little town perched on a hill with an attractive church, towers and restored watermill to dicsover. Gardouch: Visit the village's beautiful church and eat in one of the excellent restaurants. Castanet-Tolosan: A short distance from the Canal, Castanet-Tolosan has a busy shopping centre where you will find everything you should need. Toulouse: Fourth largest city in France with a cosmopolitan vibe, strong café culture and a wealth of museums and tourist attractions. Montgiscard: A quiet 13th century town with a gothic church and a good restaurant close to the lock. Villefranche-de-Lauragais: 2km from Renneville Lock, you’ll find a variety of amenities and a fine example of a church with a traditional wall bell-tower. Port-Lauragais: This purpose-built tourist marina has good moorings for the night with a restaurant. 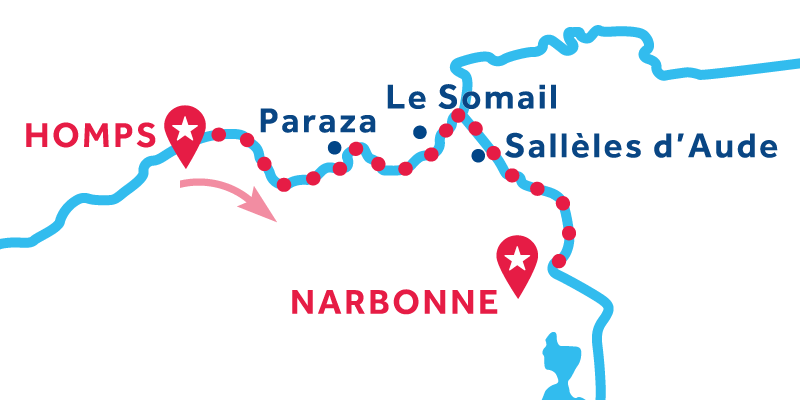 A one-way week-long cruise from the historic Roman town of Narbonne. Take in the spectacular staircase of locks at Fonserannes as you cruise both the Canal du Midi and the Embranchment de la Nouvelle. Arrive Homps: The small village of Homps, where Le Boat has a base, was for a long time an active trading port where barrels of Minervois and Corbières wine were loaded for their journey to Bordeaux. A week-long one-way cruise that packs in plenty of activities to fill your days, from wine-tasting to waterparks you are sure to be entertained. A week-long return cruise along a peaceful section of the canal that takes in charming small villages on the way to the impressive Carcassonne. Villesèquelande: Seek out the pretty church and clock the Sully Elm, planted in the square outside; it is one of the oldest elms still alive in France! A week-long return cruise past some of the top sites on the Midi to the historic fortress of Carcassonne and back. 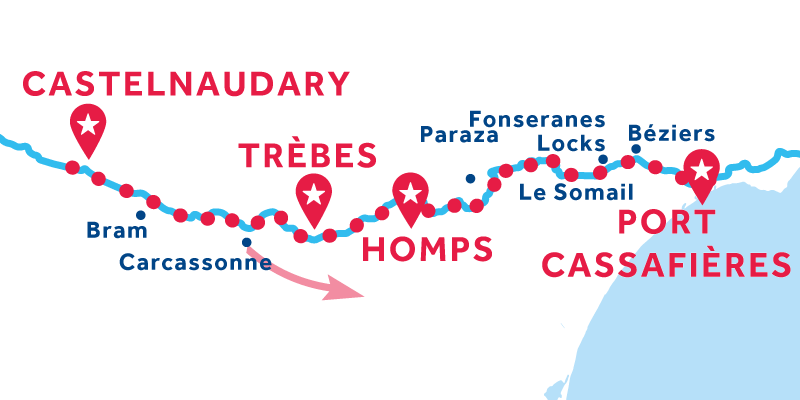 A week-long one-way cruise that takes in a good balance of must-see sights (including not-to-be-missed Carcassonne) as well as the quieter parts of the canal. A week-long one-way cruise that lets you enjoy some of the midi’s most charming villages, offering plenty of places to stop and enjoy the local food and world-class wine. Arrive Trèbes:Stock up on excellent local produce including wine, olives, jams and confits. Then visit the family friendly Cavayère Lake. A short one-way cruise that includes the Midi’s most impressive engineering features. 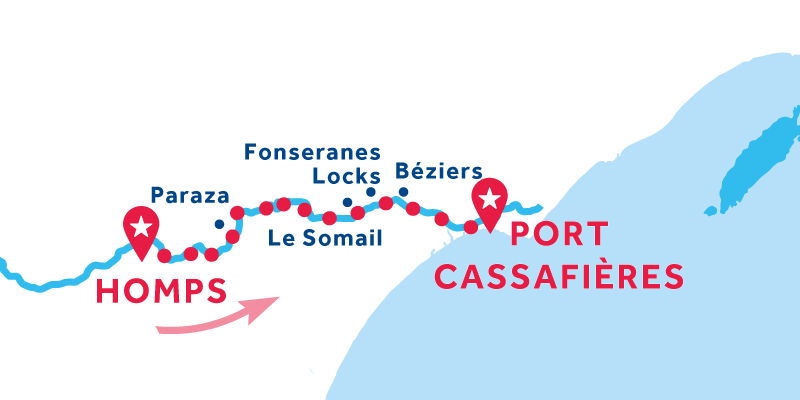 Cruise through the Malpas Tunnel and ascend The Fonserannes Locks on you way to Port Cassafières. A week-long one-way cruise along an action packed section of the canal, taking in idyllic villages and the engineering marvels of the Malpas Tunnel and the Fonserannes Locks. A short one-way cruise perfect for those travelling with kids. Visit Cavayère Lake and Carcassonne for family fun that is sure to keep the little ones (and big ones) entertained. A short return cruise that takes you along a peaceful stretch of the canal with quiet villages, ideal for those looking for a relaxed getaway. A short return cruise along a section of the Midi with lots to see and to do on your way to beautiful little Languedoc village of Le Somail. A short one-way cruise that allows you to cruise both the world-renowned Canal du Midi and the spectacular Embranchment de la Nouvelle over just three nights. Argens-Minervois: Home to a 14th century château and cobbled streets, this is a lovely place to stop and enjoy the ample cafés and restaurants. Roubia: Roubia is very pretty with an old stone church and tower, there’s also a grocery store and restaurant in the village. 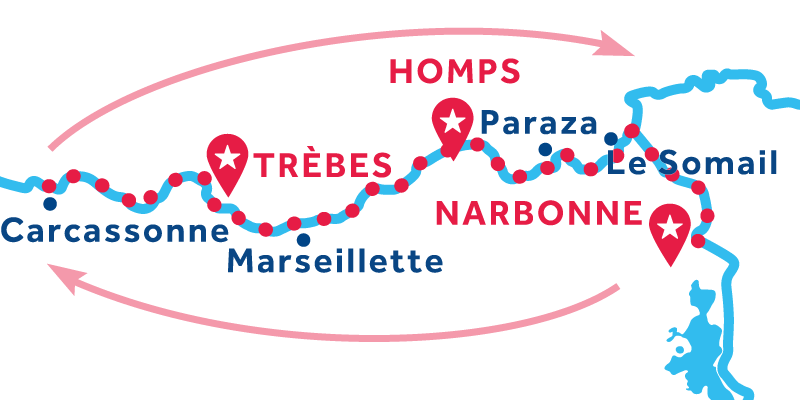 Arrive Narbonne: Enjoy a wonderful southern French atmosphere with a Spanish twist. Visit the Saint-Just-et-Saint-Pasteur Cathedral (the third tallest in France) and the Archbishop's Palace. A short return cruise ideal for those looking to visit the magnificent citadel of Carcassonne - the biggest medieval construction in all of Europe. 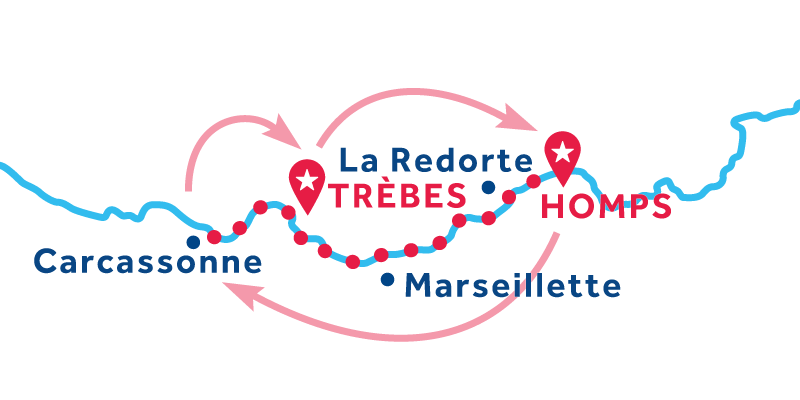 A short one-way cruise along the Embranchment de la Nouvelle, with plenty of activities and easy access to Mediterranean beaches. Gruissan: Located 5km away from the canal on the Mediterranean coast, the narrow streets of old Gruissan village are built around the 13th century castle and form a circular pattern. Port-la-Nouvelle: Port-la-Nouvelle, the last town on the Embranchment de la Nouvelle. On the seafront you'll find many restaurants and bars, and the beach is wide and sandy. Sainte-Lucie Island: Walk or cycle in the nature reserve, and look out for wild pigs and deer, as well as amazing birdlife. Very friendly and helpfull staff both in Port Cassafiers as in Castellnaudry. The boat was great, easy to use, cabins were large with lots of storage space. Great experience, but a bit too large of a distance to do in 7 days. Many locks have delays , we would have preferred to be able to spend more time in different towns along the way, but because of time pressure we had to keep going. I can only blame myself for not doing more research. Le Boat gave us a nice, large boat for a group of 8. There were a few small problems, including bikes that developed flat tires, a sledge hammer with a bad handle that made hammering stakes difficult, and an electrical breaker problem that caused lights not to work for several hours. However, overall the canal cruise went as planned and everyone was pleased. The galley is very functional and roomy for a boat. The deck at the top was a nice place for everyone to relax. When we brought the boat back to a Le Boat base, the breaker issue and the bikes were fixed (although there was another bike flat tire later). The people in France were very friendly, and the wine and food were excellent. We are very sorry to learn about the flooding in Trebes that happened soon after we left! The weather was great almost all of the canal cruise! Easy to book and speak to someone if required. Check-in was quick & easy. A totally relaxing holiday, once you get to grips with the locks! The Tango was ideal as there were just two of us on board. Booking and Check-in was easy. We had great weather and our trip was in fall which meant the reduced number of people took the pressure off all aspects of the trip. The boats were not perfect but the overall experience was excellent. The trip was in September, the temperatures were reduced from the summer heat but the weather was superb. We had no lock queues to speak off and no hassles. The tourist numbers were considerably reduced from Peak summer so we often found time to relax and enjoy the Countryside. The service from the pick up / on canal and the drop off staff was very good. It was all great. The poor boat had obviously had a long summer and there were various things not either in great order or not working properly. Being fairly used to boating and yachting we were able to have a good time. the people helping out were friendly and accommodating. my only concern was the quality of the onboard introduction by the young man. He spoke a bit to fast and with english his second language, it made understanding even more difficult. The intro was also not thorough enough. fortunately, I have boating experience and was able to fill in the gaps. everything else was great except for loose toilet seat and a light that was randomly short out. we really enjoyed going at our pace and stopping and starting at our schedule. Castelnaudary, the capital of Cassoulet offers a variety of things to see – not least the impressive views over the Black Mountains from the Cugarel Windmill view point. It is a great start (or finish) for boaters looking to enjoy pleasant countryside and a lazy meander past quiet towns and villages. A 7-night cruise to the west is a peaceful return journey to the contrasting hubbub of cosmopolitan Toulouse. However, most boaters choose to head east where, after two days of tranquil cruising, you’ll reach the spectacular fortified citadel of Carcassonne, the second most visited tourist attraction in France. Located on the Canal de la Robine, Narbonne is a bustling city with a wealth of historic sightseeing opportunities and dining experiences. A 3.5hr cruise to the south, where the canal winds past vast open lakes, you’ll reach the fishing village of Port-la-Nouvelle where you can visit the sandy beaches. 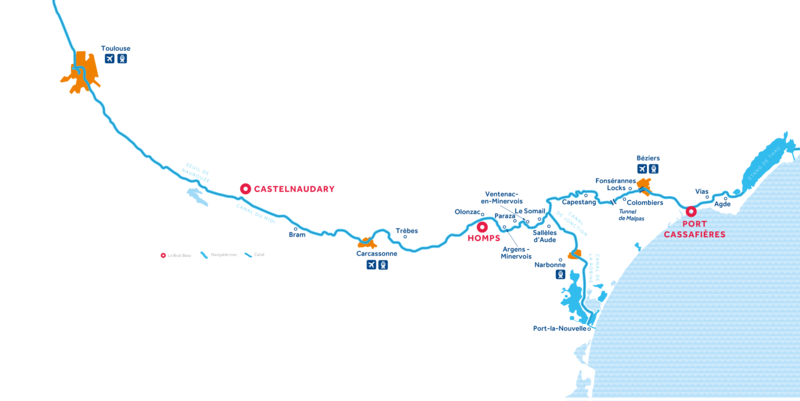 Alternatively, head 4hrs north and you’ll intersect with the Canal du Midi. You have the choice then to head west to lively Béziers (11hrs from Narbonne) or east past pretty Le Somail and the central Midi region. 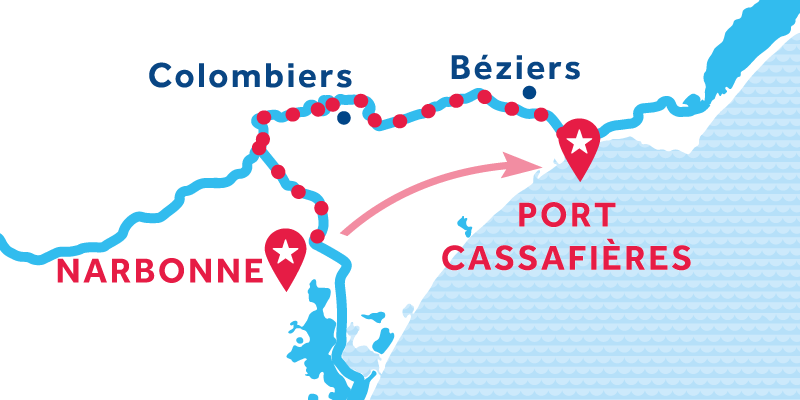 Port Cassafières is perfect for families, with the sandy beach of Portiragnes nearby and a 1hr cruise to the east await the fairgrounds, adventure golf and go-karts of Vias. 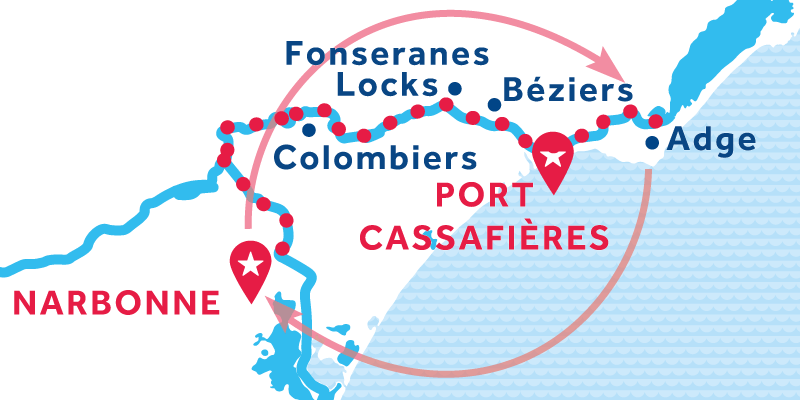 A short 2hr cruise to the west will find you in Béziers, a city bursting with history, art and culture with a flight of seven locks just a little further along the canal, at Fonserranes. 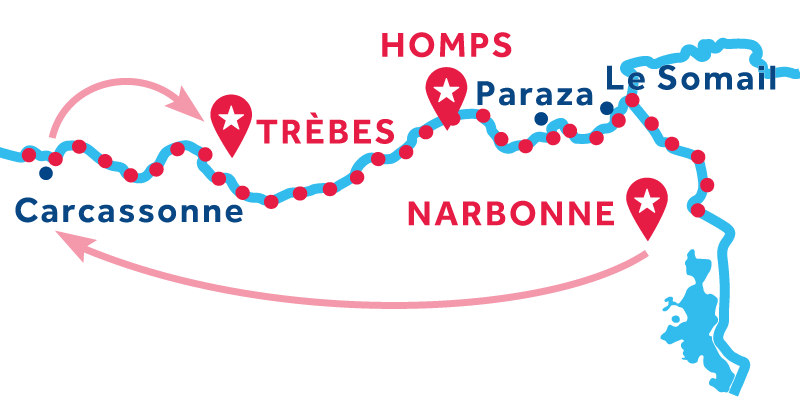 Then it’s onwards past a multitude of historic sites and pretty villages until you reach a junction (9hrs from Port Cassafières) – you must decide whether to travel south towards historic Narbonne, or maintain course along the Midi, past pretty Le Somail.